Lençóis Maranhenses National Park, in Maranhão State, is one of Brazil's top natural attractions. It is an ecosystem formed of white sand dunes which cover 383,000 acres and look like bedsheets (lençóis in Portuguese) spread out on the Northeastern coast. Seasonal lagoons which fill up with rainwater, mostly during the first six months of the year, make Lençóis Maranhenses a unique kind of landscape. Mangroves, deserted beaches, bursitis —a graceful kind of palm tree—and the Preguiças River help compose the park's diversity. The park is about 156 miles from São Luís, the state capital. 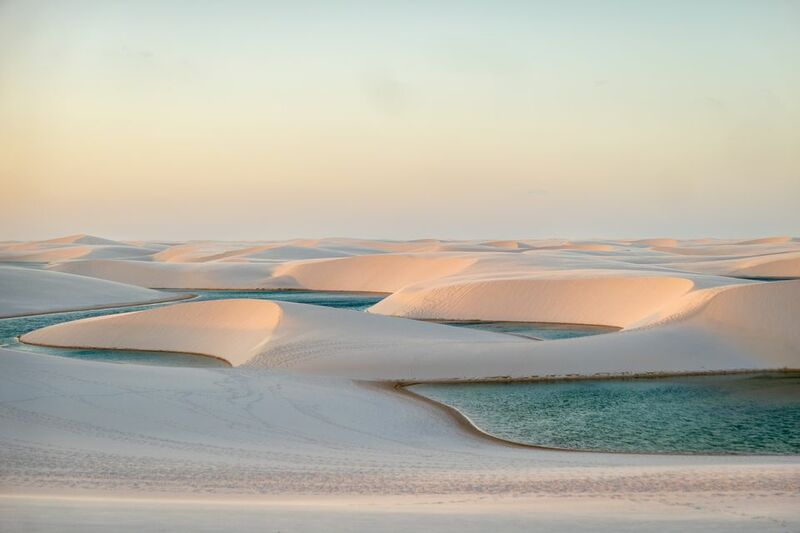 Lençóis Maranhenses has been formed over thousands of years, as the sand from riverbeds is deposited at the mouth of the rivers and brought back to the continent by winds and sea currents. The dunes advance as far as 31 miles into the continent and stretch along 27 miles of coastline, mostly deserted beaches. Some of the lagoons at Lençóis Maranhenses National Park are huge. Lagoa Bonita and Lagoa Azul are near the town of Barreirinhas. Lagoa Tropical, also worth a visit, is closer to the village of Atins. Lagoa da Gaivota (Seagull Lagoon), one of the park's largest and most beautiful, is near Santo Amaro do Maranhão, a village located about 60 miles from Barreirinhas. Access to the park is controlled by ICMBIO and only certified agencies can take travelers. There are no amenities except in Barreirinhas and in the villages. The area around Santo Amaro do Maranhão and Lagoa da Gaivota can be seen in the Brazilian movie Casa de Areia (House of Sand, 2005), directed by Andrucha Waddington. The isolation of Lençóis Maranhenses at the beginning of the 20th century, when the movie starts, is not such a distant reality for the region's communities: the paved road (MA-402) between Lençóis Maranhenses and São Luís was only finished in 2002. The best time to visit the park is roughly from May to September, when it's sunny, yet the lagoons are still full. Always assume it will be hot in Lençóis Maranhenses. Temperatures often reach the high 90s, even during the Brazilian winter (June-September). Protect yourself with sunblock and a hat while visiting. The wind is a major cooling factor in Lençóis Maranhenses, and so are the park's lagoons. The gateway to the park is Barreirinhas, located about 156 miles from Sao Luís. Cisne Branco Turismo has daily buses departing from the São Luís Bus Terminal (Av. dos Franceses, 55-98-3249 0778). One-way tickets cost 29 Brazilian reals and the trip takes about 4 hours. Cururupu (55-98-3244-1511, cururupu@cururupu.tur.br) has daily charter flights leaving the São Luís International Airport at 7 a.m. and Barreirinhas no later than 5 p.m. The two-way flight costs 1800 reals with same-day return trips. The plane can take up to five passengers. Expect to find great fresh seafood at local restaurants, from hotel restaurants to remote outposts such as Luzia's kiosk in Atins, at the end of a two-hour walk. In Barreirinhas, one of the most famous places serving regional food is Restaurante do Carlão. You'll also find treats such as diverse as pizza, tapioca at Oca da Tapioca at the boat deck on the river and ice cream made from native fruit at Sorvetão, in central Barreirinhas. The trip along the coast from Lençóis Maranhenses National Park to Jericoacoara, Ceará covers beautiful and still pristine shores, including the short coast of Piauí and the spectacular Parnaíba Delta. Some longer tours, lasting about eight days, might include a stop at Parque Nacional de Sete Cidades, Brazil's most famous archaeological site. Some of the hotels in Barreirinhas offer transfers to Jericoacoara. You can also take tours to Jeri with adventure travel operators specialized in the area's attractions. One of those companies is Piauí-based Eco Adventure Tour. ABETA (The Brazilian Association of Adventure Travel Companies, www.abeta.com.br)has a list of certified operators offering Lençóis Maranhenses tours.